This article describes Geometrica’s contribution to the collaboration between Carthage Cement, FLSmidth (FLS) and EKON to produce the largest and most technically advanced cement plant in Tunisia, writes Melanie Saxton of Geometrica. The challenge was to balance the needs of the regional environment and nature preserve with a world-class industrial cement manufacturing facility. ORCHARDS, WINE... AND CEMENT In Arabic, the name Djebel Ressas means ‘mountain of lead’, a reference to the ore that has been mined near this 800m peak in Tunisia since antiquity. To this day, this region continues to be a rich source of construction materials, which must coexist with agricultural and neighbouring communities. Carthage Cement demanded from the engineers and builders a cement processing plant that would work harmoniously alongside the olive orchards, small herds of domestic livestock and wine production. “We paid particular attention to adopting the latest technology, high economy of energy consumption and great respect for the environment,” said Lazhar Sta, CEO of Carthage Cement, who entrusted global engineering company FLSmidth (FLS) to identify, design and implement the best solutions. Turkish contractor EKON was FLS’s partner for the civil works, including civil design, supply of structural steel and plate work, site preparation and plant erection. The civil work compared in scale to that required to build an entire town, and the immense processing facility is capable of producing 5,800 tonnes of cement per day. “We learned about Geometrica through an international cement trade magazine and the Internet,” said EKON project manager, A. Cem Sevük. “We chose Geometrica because, compared to their competitors, they gave us a better price and speedier delivery.” Geometrica worked with EKON, the builder of the plant, and supplied three bulk storage buildings. The goal was to spare the environment from dust and debris from material handling and stockpiling. This was an ideal spot for Geometrica, a design and manufacturing firm renowned worldwide for promoting beauty and environmental responsibility within industrial settings. Geometrica supplied three storage buildings for additives, coal and limestone. The additives and coal longitudinal buildings are 200m and 300m long, respectively, and similar in span (50m). The limestone building is a 90m circular dome. All domes were reinforced with arch ribs. “We assembled the domes in half-arch segments on the ground. Then we lifted the arches into place and stitched them to the growing structure. This minimized the amount of time workers had to spend working at heights,” said Fernando Gracia, Geometrica’s lead designer for the project. “Oval hubs in the bottom chord of the domes’ ribs allowed us to use two rectangular bars in parallel, reducing the overall arch count, and increasing structural efficiency,” Gracia explained. The new plant created over 400 direct jobs and now supplies cement to Tunis, the national capital and source of 50% of Tunisia’s cement demand. The environment near the ‘lead mountain’, including its orchards, livestock and nature preserve, are protected, and Carthage Cement helps Tunisia continue on its growth path. Geometrica has supplied domes in countries ranging from Canada to Chile, from Spain to Singapore, and from the UAE to the UK, with dozens more in between. Cementa AB, a group company of HeidelbergCement, decided to build a new cement terminal at Norra Hamnen (Northern Port) in Malmö, Sweden. The 30,000-tonne-capacity multi- compartment silo replaced Cementa’s existing depot at the waterfront location in Linhamn, which gives room for the building of apartment houses. However, the new silo has a far better location with regard to connecting transport operations. For planning and construction of the new terminal a number of project challenges were given. IBAU HAMBURG was chosen as the turnkey contractor for the project. Handing over of the project was in November 2011, less than two years after planning, construction and commissioning. Malmö is an important cement distribution hub for Cementa AB in Sweden. The new 30,000-tonne-capacity terminal was designed to fully cover future needs in terms of storage capacity and cement types. The location in Norra Hamnen of Malmö allows the feeding of the silo via Cementa’s cement carriers. Cement distribution is by trucks and by railcars because there is a railway line next to Norra Hamnen. The silo location has less environmental impact on nearby residents than the former cement depot in Linhamn. The depot area of Linhamn was taken over by the Malmö Municipality to become a recreationalareawithattractiveapartmenthouses. The objective of the new silo was to operate it for about 50 years. The large volume of the silo was based on comprehensive investigations of the expected demand. The silo is of multi- chamber design to achieve the greatest possible flexibility in the storage of different types of cement. For the unloading of cement ships, pneumatic and mechanical unloading facilities are foreseen. The silo has to integrate three loading lanes: two for trucks and one for a combination of trucks and railcars. IBAU HAMBURG was awarded a turnkey contract for the design and construction of the terminal in December 2009. The contract was given after first solutions were developed by the engineering company starting in March 2008. The site installation began in May 2010, commissioning ended in October 2011, the handing over date of the terminal was in November 2011. The turnkey project included, besides the engineering, delivery and installation of the terminal equipment, the piling, concrete works, steel works, electrical works and automation, erection and commissioning. In addition to the planning permission, special permits were required to set up and operate the new cement terminal. Strict environmental demands had to be fulfilled. A major issue was the expected noise level and the aesthetic design of the silo of such a large capacity. The other major challenges derived from project requirements. Cementa’s parent company HeidelbergCement decided to handle the project as a turnkey contract. Delivery of major equipment should be preferably from a single source. Also, the financial aspect was important, because the complete investment was around €15 million, which required adequate bank guarantees and could only be handled by a capable project partner. For the project, a narrow timeframe was given with just 18 months’ construction time. Major challenges also derived from the chosen project site, which was characterized by a soft underground on top of a 15m-deep rock formation. The architectural aspects required for a tall silo with some aesthetic feature, so that the complete terminal will be able to improve the harbour skyline of Malmö. Therefore, Cementa included at an early project stage local Fojab architects, of which Greger Dahlström came up with a very interesting design. The technical issues are properly described by the large storage capacity of 30,000 tonnes, the requirement for a six-compartment design, the mechanical and pneumatic unloading of 8,000dwt ships (max) with high capacity from a terminal integrated jetty, as well as bulk cement loading into trucks with trailers and rail cars with a refilling possibility, material re-circulation for longer storage times as well as a fully dust-proved design, low specific energy consumption and a completely automation, so that no operators are required at the terminal for the daily business. engineering and complete electrical installation and start-up. During the planning phase, IBAU worked in close co-operation with Heidelberger Technology Center in Brussels and it was decided that the control room in the multi-chamber silo would be moved to Level 1. This offered the advantage of considerably reduced cable paths through silo walls. Because space for the switching and control cabinets, energy distribution and transformers was limited, IBAU HAMBURG opted for maintenance-free, gas-isolated medium switchgear. The electrical installation involved a number of demanding challenges for the personnel. Installation of the cable works and laying the cable in the bucket conveyor tower — from Level 0 to 100 metres — required special cranes and had to be carried out by workers who weren’t afraid of heights. One challenge for the automation systems supplied by HAVER & BOECKER was adapting the PCS7 process control system to the silo processes so that clear and well-arranged process groups resulted and thus allowed easy operation and rapid fault detection. The multi-compartment silo is of the IBAU Central cone design. The silo has an outer diameter of 26m and a 90m height. The silo has six compartments with an inner compartment of 15.75m diameter with 10,000-tonne capacity and the outer ring compartment, which is split into five separate compartments, each having 4,000 tonnes of storage capacity. The construction of the silo required 8,200m3 of concrete, 1,300 tonnes of prefabricated concrete elements, 1,600 tonnes of steel reinforcements, 700 tonnes of structural steel, 450 tonnes of mechanical equipment and 56,000m of electrical cables. The complete weight of the filled silo construction is 70,000 tonnes. The silo foundation is loaded on 63 piles, which have a diameter of 1.5m and which are 15–17m long to transfer the silo load to the flint stone rock formation below the terminal area. Accordingly, each pile has to carry a load of more than 1,000 tonnes. The silo foundation was produced with in-situ concrete while all the silo walls were fabricated using a complex sliding formwork system. The formwork and working platform were raised quasi non-stop metre by metre with a hydraulic system. The speed of the sliding formwork and the raising of the platform were adjusted to the drying time of the concrete. Every day a height of 1.5–2m was achieved so that the entire slip-forming was completed in 25 days. On each shift, up to 50 construction specialists were needed for this job and about 60 others for the steel reinforcements. The architectural design of the silo comes from the white- pigmented silo surface which also includes two vertical conveyors situated in a stair tower, which has a circular design and which was fabricated in segments. After installation of the conveyor, the tower was covered with large white surface sheets, so that the silo and the stair tower form an integral part. The other highlights are the blue glass facade with night illumination on the silo top as well as a tubular walkway with integrated fluidslide conveyor between the jetty and the silo. It has always been Cementa’s ambition to have an aesthetically pleasing and functional terminal facility. It can now be said that Malmö has another attractive addition to its skyline. The new cement terminal is ultra-modern and fully automated. Accordingly, no operators are required and the reloading of cement onto trucks and railcars is possible at any time of the day or night by using a chip-card system. This flexibility could only be assured by installing a truck/wagon unloading system in cases when off-specification batches have been chosen. In that situation, the material in the vehicles is to be refilled into the respective silo compartment. Additionally, there is a cement recirculation system, which is activated if no ship unloading truck/wagon unloading operation is performed for a longer period of time. The silo bottom is equipped with slopes open-type fluidslides, which are covered with air-permeable woven fabrics. The aeration air is injected under the aeration fabric in order to fluidize the cement above the fabric to direct the material flow to the compartment outlets. Only one base section is active at any time for discharging a compartment2. The aeration is effected section after section, so that all sections are used in a complete cycle. Only comparatively small quantities of air are needed for the section aeration and material extraction from the compartments. The aeration air is drawn off with the material and fully dedusted before it is released to the atmosphere. Each of the five silo compartments in the ring space has an identical extraction system, which is standard in the IBAU concept3. The base of the ring compartment is made of concrete screed with a slope of 20 degrees. Each compartment has two aeration sections with a right and left hand subsection with tangential fluidslides that convey the stored material through radial fluidslides to the compartment outlet. The material flow is regulated by a flow-control gate so that there is always a fully controlled material extraction from the silo compartments. From the flow-control gates the material stream is divided and separated to the required reloading lanes. The inner silo compartment has the central cone design and a number of six outlets with six aeration sections, each with a right and left subsection, which are similar to those of the outer silo compartments. The compressed air for the silo aeration is generated by rotary piston blowers. The material discharge from the ships can be done either mechanically or pneumatically. When using the ship’s mechanical unloading screw, which has a maximum capacity of 1,100tph (tonnes per hour), the material is transported via a flexible chute towards a first bucket elevator. This bucket elevator lifts the cement to a height of approximately 15m. From there, a 35m-long fluidslide conveyor distributes the material towards the two 80m-high silo feeding bucket elevators, each having a maximum capacity of 550tph. During the pneumatic ship unloading, either by pressure vessel or pump system, depending on the vessel, the material is discharged with a maximum capacity of 400tph to a collecting bin, located inside the stair tower. From there the material is transported to one of the two silo feeding bucket elevators. Furthermore, the silo can also be fed from a truck unloading station by using the same collecting bin. Cement bulk loading from the silo is via two truck loading lanes and one combined truck/railcar loading lane. Each loading lane is equipped with three IBAU mobile loaders with a loading capacity of 250tph and either ±2.5 resp. ±3.0m travelling range. The main characteristic of the loading devices is their flexible structure compensating for differences in the height of various tank trucks and the travel mechanism which allows the mobile loader to be positioned exactly above the blow tank filling socket. The electrical and automation concept of the terminal, which was planned, installed and delivered by HAVER & BOECKER allows a safe and reliable reloading of cement by using a chip-card system. All operations, such as mobile loader positioning, can be facilitated by the truck drivers. No Cementa operating personnel are required. Plant commissioning took place in October and November 2011. During that time cement, was delivered by cement carriers of different ship sizes. All terminal functions were tested and were according to the requirements. The new Malmö cement terminal is a truly world-class cement storage and distribution centre. The facility is of major strategic importance for Cementa AB and the growing Malmö and Öresund Region. With the terminal location at Norra Hamnen, Cementa now owns a convenient logistic facility, where ship, road and rail transports are taken into account. The complete project was fully supplied in time, according the client’s expectations and without any accidents at all. IBAU HAMBURG, the turnkey contractor for the terminal was thus able to supply another facility, which is a benchmark for the industry. The turnkey capabilities of the company begin with a pre-order concept study, detailed planning and design and end with the timely project delivery. Specific job functions are provided by very appropriate sub- contractors, while IBAU HAMBURG has the complete project know-how and integrates mechanical and pneumatic equipment that best fits the client’s needs. 2 Buschmann,H. :TheVersatility of Multi-Compartment Cement Silos. ZKG International. 7- 8/2010, pp. 84-92. 3 Hepberger,M.,Bostelmann, J., Rahn. S.: ‘Conversion of a cement silo to a 5- compartment silo.’ Cement International 5/2011. pp. 62–68. Jenike & Johanson is a renowned technology company for bulk material handling, processing, and storage. It delivers engineered solutions to achieve reliable powder and bulk solids flow based on proven theories and decades of project experience. Most new plants or line expansion projects are seeking techniques to reduce production costs, while minimizing adverse environmental impact during cement production. To meet ever- increasing demands, cement kilns must have consistent, reliable feed of raw materials, such as limestone, clay, sand, mill scale/iron ore, and bauxite. Though dry process cement plants are advantageous over wet process plants due to significant energy savings, they experience additional material handling problems during feeding, milling, and calcination. Cement plants continue to seek ways to reduce fossil fuel consumption through use of alternative fuels. Clinker substitution with limestone or pozzolanic additives is now a common practice. Cement quality relies upon consistent kiln feed and reliable raw mix formulation. The majority of raw materials handled at a cement plant are prone to poor flow during reclaim from stockpiles, storage silos, or hoppers. These problems can lead to process upsets, down time and require frequent operator intervention. Materials handled are often dusty, cause abrasive wear of equipment, and stick in chutes and conveyors, all contributing to reduced cement output. Erratic feed and wide particle size variability (segregation) will lead to poor mill performance, increased energy consumption, and vibrations in vertical roller mills. Cement can be prone to both caking and flooding (flushing) behaviour. Below is a shortened list of the bulk materials Jenike & Johanson has successfully handled in the cement industry to date.This is just a small sampling of the materials the company has handled for clients in the cement industry. The materials include: alternative fuels; alumina; amorphous silica; ash; bauxite; borax, anhydrous; cement; clay; coal; coke; diatomaceous earth; dolomite; foundry sand; fuller’s earth; granite; gravel; gypsum; lime; limestone; magnetite; mica; pozzolan; pyrite cinders; quartz; quartzite; raw meal; sand mixtures; shale; silica; silicon; slag; stone dust; and volcanic ash. The following is a sampling of clients for which Jenike & Johanson has successfully provided bulk material engineering services for in the cement industry. These include: Atlantic Cement; Ash Grove Cement; Blue Circle Cement; Caribbean Cement Co. LTD; Cemento Polpaico SA; Cementos Nacionales; Cementos Progreso; Cemex; Essroc; Fuller Company; Heidelberger Cement; Holcim; Holderbank; Holnam; Humboldt Wedag; Irish Cement; Kaiser Cement; Korean Cement; Lafarge Canada; Lafarge North America; Lake Ontario Cement, Canada; Lantic Cement, Canada; Lehigh Cement; Medusa-Citadel Cement; Nesher Israel Cement; Phoenix Cement; St. Lawrence Cement; St. Mary’s Cement; South Dakota Cement;TEC, Inc.;Tilbury Cement; and US Gypsum. Jenike & Johanson has engineered custom equipment solutions including hopper, feeders, gates, and storage equipment. Its mass flow container is a portable container for reliable, uniform powder discharge. Similarly, its mass flow tumble blender provides for reliable blending and powder discharge. The company’s BINSERT may serve as a better alternative to mechanical mixers because it is designed to eliminate stagnant zones by maximizing the difference of flow velocity in its centre. The dimensions of the BINSERT are determined by the flow properties of the solid, which helps to prevent arching. hopper analysis and design; and v	rotating equipment (kilns, blenders) analysis. Whether retrofitting bins to alleviate flow problems, implementing a new mass flow silo or stockpile to maximize gravity reclaim, or feeding alternative fuels to the kiln, Jenike & Johanson can help achieve reliable material flow and consistency at your cement plant. Titan America manufactures Portland cement at its Medley, Florida USA plant, and in June 2004 commissioned a new 5,000- tonne-per-day kiln that greatly increased clinker production capability and efficiency. However, due to poor flowing raw materials handled in the new silos, large variations in raw meal properties resulted, principally from erratic flow of limestone. and detailed engineering design of the retrofitted silo components. A discussion of each of these key efforts follows. Titan requested that engineers from Jenike & Johanson visit the Medley plant as soon as possible to diagnose various solids handling problems occurring during the commissioning of the new line. Engineers observed flow problems, such as arching, ratholing, and segregation occurring with the limestone, as well as other additives like bauxite and mill scale. The flow problems were costly to Titan in several ways: first, the production capability of the new line was less than required; second, there were numerous labourers required to unblock flow obstructions formed in the additive silos; third, the particle size variability of the limestone induced unacceptable chemistry variations (excessive lime saturation factors) in the raw meal; and fourth, valuable resources were redirected to address the ongoing critical problems. The original blended limestone silo has about a 9m diameter cylinder section followed beneath by a conical hopper then a transition hopper terminating at an apron feeder. The limestone flow problems rapidly degraded production efficiency, and in some cases, stopped production all together. The bridging problem occurred when an arch-shaped obstruction formed above the outlet of the transition hopper and prevented any further material discharge. Operators were frequently required to use sledgehammers to strike the walls of the hopper to overcome the bridging problem; in many cases, their efforts were not fruitful. Ratholing in the silo was also resulting, especially when the limestone was fine and wet. With ratholing, flow takes place in a small channel located above the hopper outlet, leaving large zones of stagnant material in the silo. Consequently, even though the silo’s total capacity was 1,000 tonnes, its actual ‘live’ capacity was far less; this required operators to vigilantly keep the silo filled so that the raw mix would contain the blended limestone. conveyor. Unfortunately,with the limestone extracted from the quarry near Titan, as the particle size changed, the chemistry of the material changed; in particular, the silica content varied substantially across the particle size range. As the level in the blended limestone changed, the particle size distribution of the material varied. After the site visit audit, Jenike & Johanson engineers recommended to Titan that flow properties tests be performed on the limestone at moisture contents ranging from 5% to 11%. The flow tests were measured using ASTM protocols. Not surprisingly, the results of the flow tests confirmed the limestone was cohesive (prone to bridge and rathole), frictional (sticks to surfaces), and compressible (having a variable bulk density). The flow problems occurring were directly influenced by the type of discharge pattern in the blended limestone silo. Per flow test results and field observations, a funnel flow pattern was resulting, whereby an active flow channel forms above the hopper outlet, with large dead zones of material residing in the silo. As the level of limestone in the silo decreased, the non-flowing material generally did not slide into the flowing channel, which resulted in the formation of a stable rathole. Jenike & Johanson recommended to Titan that a mass flow pattern be implemented, which allows a first-in, first-out discharge that prevents ratholing, ensures consistent flow, eliminates sifting segregation, and reduces the loads on the apron feeder. The recommended modifications to the silo involved installing a new, steep conical hopper that extended past the existing cone up into the existing cylinder section. A new transition hopper, pin gate, and mass flow interface was implemented above a new apron feeder. A separate weigh belt feeder was placed below the apron feeder, but oriented to run in the opposite direction so that the feeder allows weighing capability as well as clean-up duty, which eliminated the need for a separate dribble conveyor running below the apron feeder. Johanson engineers worked closely with apron feeder and interface supplier to ensure its structural integrity and functional design specifications were strictly followed. Abrasive wear tests were conducted to assess erosive wear life of various liners for the interior silo walls and the interface. Analyses were also performed by Jenike & Johanson to determine material-induced and external loads (e.g., wind, seismic, etc.) on the silo and structure. Bulk solids do not behave like liquids since they develop frictional forces against the wall in their static and sliding conditions; this considerably affects the loads on the silo structure. Material-induced loads from initial fill and mass flow discharge scenarios were analysed. Generally, retrofit projects in silo structures are more complex than new silo construction. In addition to meeting strength requirements, the new components in the silo have to be designed for easy installation and be sized to fit space constraints due to surrounding structures, equipment, etc. During the structural design phase of the project, it was decided to install the new mass flow cone inside the existing structure without demolition of the existing cone and support system. An arrangement of vertical stringers and rings were designed to facilitate installation of the conical hopper. The conical hopper was designed to be supported at its top edge by welding it to the cylinder. With the location of the new mass flow cone, the load transfer to the supporting structure was modified. The cylindrical portion below the cone top edge was required to carry all the structure and material weight as well as resisting external loading. The transition hopper was designed to be a bolted connection to the adjacent components of the structure, with its pieces to be assembled on-site; this approach simplified installation. The engineering for the arrangement/installation of the steel liner panels as well as their connection details to the new cone and existing cylinder was provided to Titan. According to John Anagnostou, production manager at Titan, the modified silo has provided reliable, consistent flow of the blended limestone, even when handling moist and fine material. Since the modifications, mass flow has been achieved which has eliminated the costly bridging, ratholing, and segregation problems. The apron feeder has worked well, and the weigh belt feeder/clean-up conveyor system has allowed fine-tuned control of the raw mix chemistry. Not only were critical details for flow supplied, but also, engineering specifications for demolition, scaffolding, installation, and fabrication were provided to Titan in a complete drawing package. Telestack offers a range of mobile bulk material handling solutions. Below are details of three different applications, which illustrate the flexibility that the company’s technology provides to the cement industry. 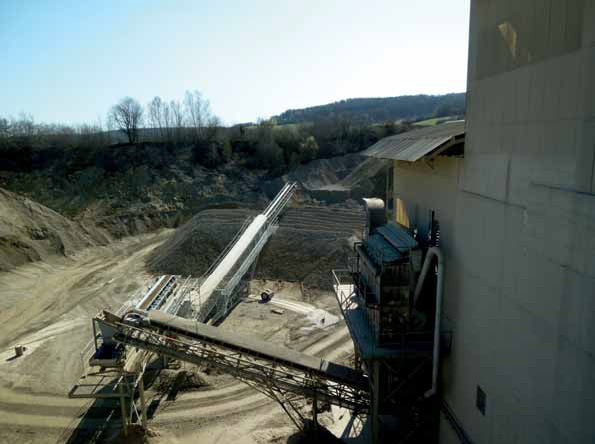 Telestack’s customer in Europe operates a limestone quarry for its cement plant operation. It handles a range of materials for construction and cement manufacturing such as lime, cement, plasters, mortar, crushed sand, aggregate and various environmental products within the plant; it is critical that all of these materials are handled in the correct manner. Previously, the customer used wheel loaders to stockpile the recycled material from the calcinations of the limestone for the making of its cement. This method was ineffective in operation as it created unwanted dust generation, degradation and segregation and compaction of the material. It also involved high costs for fuel, labour and maintenance of the wheel loaders. As the material was stockpiled in this way, this significantly degraded the quality of the material that was fed into the furnace. To reduce costs and improve this process, the customer installed the Telestack radial telescopic stacker which is used to stockpile the raw material for the plant that was to be loaded into the furnace for the cement-making process. During this process within the furnace, the material can only be loaded if it is within certain specifications; this is to ensure that only the ‘in-specification’ material is fed into the system to guarantee the correct product ratio. For the customer to achieve this ‘in-specification’ material, Telestack installed its radial telescopic stacker to automatically stockpile the material in windrows. This method of stockpiling is scientifically proven to reduce/eliminate the segregation, degradation, contamination and compaction of the material. The radial telescopic stacker automatically stockpiles the material and radials left/right via the electric hydraulic- driven wheels, raises/lowers and telescope’s in/out to allow for a windrow type stockpile to ensure the ‘in-specification’ material is maintained throughout to feed the furnace. The all-electric-driven unit stockpiles up to 96,600 tonnes of material at 270° (based on 1.6t/m3) in one area for large stacking capabilities. The unit is fully integrated into the current electrical communication system within the plant so it can be monitored and controlled from one central location. The inclusion of full-length galvanized dust covers ensure there are minimal dust emissions on site. Also, the dual access walkways the length of the outer conveyor allow for easy maintenance and safety for the operator. At a full length of 42 metres (140ft) length, the TS 542 radial telescopic stacker can discharge at heights up to 13.05 metres (43ft) at 500tph (tonnes per hour) for maximum capacity in the small areas within the site. By utilizing Telestack’s technology, the customer has reduced its operating costs significantly. The elimination of wheel loaders for stockpiling the material has meant a saving of 3,000 hours per year of operation of the wheel loader. Taking into account fuel consumption, labour and maintenance (tyres etc...) of a typical medium-sized wheel loader, this represents significant savings. In terms of fuel alone, the customer has saved 40,000–50,000 litres of diesel per year by using the Telestack radial telescopic stacker in place of the wheel loaders that were previously in operation. Also, from an environmental point of view, the carbon emissions have been significantly reduced on site, the noise level is reduced, and the dust generation is significantly less. Telestack can also help improve site safety as the elimination of wheel loaders reduces site traffic movements and the potential for accidents. Telestack has recently been awarded a contract for a mobile track mounted truck unloader in South America for stacking cement clinker in covered storage. The unit was chosen for several reasons but the system’s flexibility and mobility were major factors in the decision-making process. The client imports clinker into the country in Handysize vessels and unloads these using mobile harbour cranes into conical hoppers. Road trucks receive the material from the conical hoppers and bring the cargo to the covered storage area. The trucks then reverse onto ramps which are hydraulically foldable for transport and they then tip the material into the Telestack mobile truck unloader for the stacking of the material. The material will be regulated in the feeder by means of a levelling blade which can be manually adjusted. The material is then transferred via a chute incline radial conveyor boom. The boom has the ability to slew ±45°, creating a radial stockpile. The radial boom slews on slew bearing and is driven by a hydraulic motor with limit switches, limiting the slew range to a maximum 45° angle of centre line in a left/right direction. The incline boom can be positioned at a angle of inclination from 8° up to 23°. An additional feature of an ultrasonic height sensor allows for a minimum drop height of clinker which reduces dust emissions and degradation of the material. The unit can stockpile to a height of 9 metres which gives a conical capacity of 1,680 tonnes at 1.4t/m3 and a radial stockpile capacity at 90° of 6,125 tonnes. The truck unloading/stockpiling machine is fully self-contained with a CAT 4.4 litre engine generating 96kW of power. The mobile truck unloader is track mounted and has optional rubber pads therefore not marking the concrete within the storage area. The client commented the TU521R will significantly reduce the operating costs for stacking of the clinker in the storage area. Prior to this contract, a 30-tonne excavator was used, which could only attain a heap height of 6 metres. The client will also increase its storage capacity with the same footprint. Further, less dust will be generated when stacking, resulting in a better quality product and a safer environment for company employees. Telestack has recently commissioned and installed a mobile reclaim hopper into sand and gravel operation in Europe. The client replaced a previous system which could only be fed with a 50-tonne excavator — consequently the diesel consumption for the excavator was excessive. The client had a very specific design brief for the new mobile reclaim feeder; some of the technical features are detailed below with regards to the unique design needed to meet the client’s particular requirements. The client chose a CAT 980 wheel loader to perform the reclaim operations from the mine face to the mobile reclaim feeder. Due to the reclaim hopper being track mounted, it can be easily manoeuvred along the uneven mine surface to a suitable position from where the wheel loader will feed it. This distance can vary between 20–50 metres. After 50 metres, load and carry distance has been reached, so the client moves the ground conveyor closer to the mineface and repeats the process. The wheel loader picks up the run-of-mine material which ranges from fine sand to 350mm gravel boulders. The wheel loader then carries the material to the hopper which is fitted with a 1,500mm aperture tipping grid. The grid is a heavy duty construction and the grid bars are made up of coffin shaped bofor bar. The grid size is remote control operated from the driver’s cab of the wheel loader. The grid can be tipped to an angle of 80°, which enables the effective removal of boulders which normally would become entrapped in the grid. The grid is reversible which enables it to be quickly changed to tip either side of the hopper. The material greater than 150mm is rejected and material under than 150mm passes through the grid and into the hopper which is lined with 10mm Abro 400 liners. The hopper has a capacity of 18m3 and incorporates a drag out feed out conveyor. This feeder is speed-controlled by means of a variable-speed drive and in conjunction with a variable height gate means that the client can finely set the machine output. The feed conveyor of the hopper is fully skirted up to the discharge point where it passes onto the incline conveyor. The incline conveyor has the ability to slew ±90°. The incline boom also incorporates an anti roll back system to prevent the larger boulders from rolling back in event of material feed stopping. The complete system is powered by a 165kVA CAT enclosed generator set or can be powered by mains electricity to further reduce operating costs. From the mobile reclaim conveyor the material is then transferred to a ground conveyor which feeds the material onto a primary surge stockpile. The stockpile is automatically reclaimed and gives a buffer of three days processing to the crushing and screening plant. The client has realized the benefits both in terms of reduced operating costs for reclaiming and also increased manoeuvrability and quicker set-up times. Telestack offers a range of mobile bulk material handling solutions which are in operation across the globe handling materials such as coal, iron ore, aggregates, fertilizer, grain and so forth in mines, ports, quarries, power plants, steel mills and cement kilns. Starlinger is a machine manufacturer, which specializes in equipment for the production of woven plastic packaging, and its products are widely used in the cement industry. The company supplies machinery for every step in the bag-making process: tape extrusion lines, tape winders, circular looms for weaving of endless tubular tape fabric, coating and lamination lines, flexographic printing machines, and sack conversion lines. Starlinger’s customers are mainly packaging producers who cater to the construction and building materials industry (cement, lime, gypsum, and so forth) but also the chemical (powders, resin, etc.) and food (flour, grains, cereals, dry pet food, etc.) sectors. In recent years, a growing share of cement producers have started to produce their own packaging, many of them using Starlinger technology to produce woven block bottom sacks to provide durable and highly protective packaging for their product (AD*STAR® technology). Woven tape fabric is also used in FIBC production, providing adequate strength and durability. The main markets are the Middle East, Maghreb and Central African countries, China, India and the South-East-Asian region, as well as Latin America. To keep its customers one step ahead of the competition, Starlinger continuously improves existing technology and develops new technical features that improve production efficiency, output and product quality. The aim is to reduce the production costs of the sacks and thereby ensure competitive prices. An important cost factor for producers is raw material: as natural resources are getting scarcer, raw material prices continue to rise — in the case of polypropylene, prices have increased by more than 18 % since 2008. Less packaging weight means less raw material input: with this fact in mind Starlinger gears production technology towards less raw material consumption, ensuring at the same time that the required packaging characteristics are achieved. The special properties of woven polypropylene tape fabric make the produced sacks extremely break- and tear-resistant, despite being very thin and lightweight, and ensure that their content is protected against humidity or other environmental impacts. To give an example: a woven sack that holds 50kg of filling weight can weigh as little as 55g itself. especially in the field of cement packaging, Starlinger combined it with the brick shape and suitability for automatic handling of paper bags and created a new packaging concept that is used worldwide today. Dangote Agro Sacks Ltd., Nigeria. Machinery for the production of 240 million AD*STAR® sacks/year to increase existing capacities. Products and application: block bottom valve sacks made of laminated woven polypropylene tape fabric for cement packaging, open-mouth sacks for agricultural purposes. High-speed conversion line for block bottom valve sacks ad*starKON SX+ Designed for the economic production of standard, open mouth, 2-ply, pocket valve and BOPP laminated AD*STAR® sacks with patented hot air sealing technology. High production efficiency is achieved with quick material roll and format change, little machine downtime and a very low waste rate. Production speed: up to 100 sacks/minute. The pin-free continuous sack transport system and the high-precision bottom forming section ensure reliable bottom and top closure without harming the fabric. An integrated fabric width monitoring system continuously checks the fabric width and automatically compensates width variations, ensuring constant high-quality bottom geometry. This not only avoids unnecessary machine stops, but also reduces the number of rejects significantly. The RX 8.0 loom is primarily designed for the production of PP and HDPE tape fabric for heavy-duty applications such as FIBCs, tarpaulins, as well as geo- and agrotextiles.The eight-shuttle loom ensures high-quality fabric production within a weight range from 55 to 260 g/m2. Electronically controlled settings and well- engineered technical features ensure high-quality fabric, easy handling and smooth operation. The use of new materials for the loom components reduces strain and friction on the tapes and increases the lifetime of wear and tear parts, keeping maintenance and spare part expenses down. To extend the size range of AD*STAR® block bottom sacks and to reach the end-consumer market it is now possible to produce also very small sack formats on Starlinger block bottom bag conversion lines. The *mini AD*STAR® sack is currently the smallest woven block bottom valve sack worldwide. With a capacity of 5–15kg (depending on the bulk weight of the content), it is perfect for packaging smaller quantities of dry bulk materials sold in the retail sector. Starlinger & Co. GmbH, a Viennese family business with production sites in Weissenbach and St. Martin, Austria, and Taicang, China, has been in the mechanical engineering industry since 1835 and has been exporting products worldwide for over 45 years. Being the world market leader in the field of machinery and complete lines for woven plastic bag production and PET (polyethylene terephthalate) recycling and refinement, Starlinger has an export quota of more than 98 % and is a synonym for leadership in quality and technology in over 130 countries. Branches in Brazil, China, India, Indonesia, Russia, South Africa, USA and Uzbekistan underline Starlinger’s emphasis on customer-oriented service and support. AD*STAR® is a registered trademark.AD*STAR® sacks are produced exclusively on Starlinger machinery. Ausenco has extensive experience, and has provided services to the cement, concrete and aggregate industries ranging from preliminary studies, detailed design, site resident engineering, construction consultation and programme management of projects ranging in size from small upgrades or modifications to major plant additions, upgrades and optimizations. Ausenco provided detailed design and assistance in construction supervision for modifications to increase the production capacity of the Tilbury Cement Plant by approximately 20% to over 1,050,000 tonnes/year. removal of the existing planetary cooler and installation of a grate cooler and all ancillary work including conveyors and a new electrical room. Air from the cooler is ducted to a new electrostatic precipitator where it is cleaned before being discharged to the atmosphere. modifications to the pre-heater tower including a new calciner, a new gas burner to the calciner, and a new coal burner to the riser duct. conversion of the direct pulverized coal firing system to indirect firing, including the installation of an inert gas generator, dust collectors, and a new coal silo. The major emphasis of the project was on design and contracting strategies to allow as much work as possible to be carried out while the plant was in operation. Cooler replacement was completed during tightly scheduled eight week plant shutdown. The project involved construction of a preheater precalciner kiln line, raw grinding, solid fuel firing, along with storage areas and silos, material handling, finish grinding, shipping facilities and an underground mine. Project features included the latest in dust control technology, centralized closed loop re-circulating water system, central air compressor station, central control room and laboratory. Ausenco provided design, site management, engineering quality control, coordination and integration between the project team, contractors and the operations team. The site management functions included engineering and construction quality control, safety OCIP (owner contractor insurance programme), contract administration, schedule and cost monitoring, and document control. Client: Poraver North America Scope: Design a new manufacturing facility Services: Process assessment, design, construction management Poraver North America (PNA) selected Ausenco to assess, quantify, engineer and develop the design for a new state-of-the- art North American manufacturing facility. PNA manufactures and distributes Poraver®, expanded lightweight glass beads (.04 to 8 mm in diameter) using all colours of recycled ‘Blue Box’ glass as the base material. Originating in Germany, the existing manufacturing process represented the culmination of 20 years of development in bringing lab results to a full scale mass production facility. Existing clay expanding equipment and used cement handling equipment were modified, added, and re-modified routinely over this period, resulting in a process that could produce Poraver®, but was inherently convoluted and undocumented. Ausenco assessed the existing process, designed and constructed the first North American facility on a fast track schedule. To improve accessibility to equipment, a maximum gravity flow concept was used in the design of the material handling processes. The plant was constructed with a 33m-high roof, which incorporates multiple standardized working levels. Modularization of key process functions and phased design, procurement, construction and commissioning program allowed portions of the facility to be constructed before the design completion. Constructed in a sensitive ground water recharge zone, the plant has zero process water/effluent discharge to the environment. An intense safety programme incorporated work practices that minimized risk. The facility was constructed on budget with zero loss time accidents. This project involved an initial study of backfill options, followed by the design and construction management of a surface cement slurry plant and pumped reticulation system, as well as the underground cement slurry/aggregate dosing and mixing system. Ausenco’s scope included the design and supervision of metallurgical testwork; preparation of final process flowsheets, mass balances, design criteria and P&IDs (process and instrumentation diagrams); preparation of capital and operating costs for the entire project to a ±10% accuracy; detailed engineering and preparation of all specifications; procurement, inspection and expediting for all process equipment; and preparation and administration of all fabrication and site construction contracts and site construction management, project management and commissioning. surface crushed aggregate distributed via raise to reciprocating feeder. Ausenco conducted the detailed design and project management for the structural and mechanical components for the Lafarge Cement Mill No. 3 plant in Richmond, B.C. The 130ft × 65ft × 130ft-high structure is composed of braced frame structural steel with a number of elevated concrete floors. The highly complex spatial layout of the equipment, ductwork, and conveyors, and the necessity to provide sufficient clearance for future removal of the main mill for maintenance required unique solutions for the structural configuration. The building was modelled in 3-dimensions using the computer software SAP2000 to optimize and design the structural steel. Vibration analyses were conducted on the structural model to simulate the out-of-balance forces likely to occur during normal operations of the main cement separator cyclone. The peak velocities and accelerations from this simulated vibration analysis were then compared to acceptable limiting criteria provided by Lafarge. Minor refinements to the structure were made to limit this vibration to an acceptable level.